Glad it worked out, Ruff. I definitely prefer the one without the skulls in game. 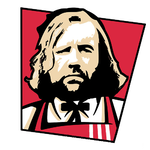 I probably won't include in the submod since we don't yet know what sigil Young Griff might be using, but I'm glad you could get some use out of it. Do you have a rough estimate of when you'll release the other CoAs? I added some of them myself but I'm not sure how to do Rhaenyra's particularly, the way you mentioned you plan to implement it. It should be within the next couple days, hopefully. I already have a great majority of the personal arms implemented, but I've got to finish up some minor things before I release it. DRP has designed some personal arms and he's kindly allowing me to implement them into the submod. Many of the personal arms were ones I was planning on including myself, so all I have to do is make sure everything lines up, but he also included a couple arms that I hadn't been able to make myself, such as Loras and Garlan Tyrell, so I'll need to script them to make sure they show up dynamically. Aside from that, all I really need to do is make some tweaks to the birth events so that characters with special sigils can pass them on to their theoretical children. So hopefully I should have it ready within the next few days. Finally got around to updating. First post has been edited with the new scope of the mod which has now become a personal arms submod, along with a download link. Enjoy, everyone! The main problem I see with adding Lord Ryswell's sons' arms is we don't know which son has which. 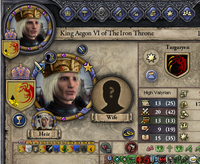 Littlefinger's mockingbird sigil is already in the base mod, he switches arms after winning the Riverlands. Also drakerlugia changed the requirements in his mod so you only need to hold a county not a duchy, to display your personal arms. Like DRP said, Littlefinger's Mockingbird sigil is included in the game, it only becomes active after he becomes LP of the Riverlands, so you'll only see it when Baelish is given Harrenhal and the eventual Lord Paramountcy of the Riverlands. There are two separate Baelish dynasties in the game, with different sigils—it's done that way so Baelish's dynasty COA changes as well. I might implement this down the line for characters who have inheritable coats of arms, but I'm not sure yet. As for adding COA, the simpliest way would be to add the extra arms to the dynasty_extra.tga file. You'll also need to create flags of the coat of arms you're adding to go in the flag folder, and you'll have to edit the coat_of_arms file in the interface folder to specify the added COA you've. This mod has 31 total COA, so you'd need to change that number depending on how many arms you add, if you've added any extra rows, ect. After that you basically need to edit the dynamic_coa file in the landed_titles folder to add your new coat of arms. Make sure the name matches what is in the flag folder, since that's what it's going to be tied too. You also need to added the dynamic_coa file in the scripted_effects folder to specify how that flag shows up dynamically. As for the Ryswell sons, I know that they have different coat of arms from their father, but we don't really know what color their horse heads are, which is the biggest reason I haven't added them. I'm trying to stick to things mentioned in the books and lore that we know of for sure. If we ever do find out more about their sigils, I'd certainly be open to adding them. @ruff: Yeah, that was an issue in the first version, it should be fixed in the new download. Basically you have to edit the coat_of_arms in the interface folder—the congenital arms need to come before this mods extras. You might have made one like it, but that's mine. 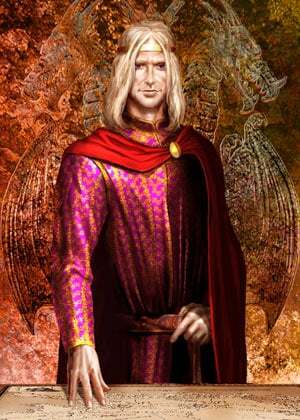 I used the the mod's targaryen CoA as a base but all changes were done by me. The same applies to all other CoAs in drakerlugia's mod. I have no idea who you are and I've never seen anything you've made. I can guarantee if you compare the individual pixels of my art to whatever you've made you will notice differences. If I were to have used anything you made I would have asked you first. I'm not a thief, thanks. Out of interest, have you thought of adding the various Harlaw variants we are told about (ie Harras the Knight is quartered scythes with the Serrett peacock of his mother, Hotho the Hunchack is the scythe with a border, Sigfryd of Harlaw Hill is two scythes counterchanged etc)?